Tired of all those UFO’s (UnFinished Objects) hanging around? If you are anything like me, you can look around your house and find multiple projects that you started and never finished. 2018 is the year we are getting them taken care of…whether that means…getting it finished or (dare I say?) frogged. If you find that you are drowning in UFO’s then here are some tips to getting them done. I liked it when I started it, but now my tastes have changed. One sleeve is just a few rows too long and all I have to do is fix it. The baby I was knitting this for is now entering kindergarten and I am super annoyed with myself for not getting it done. I still hope to finish it someday…even if it isn’t for what I had originally intended. I can definitely commit to finishing this in the next 6-12 months. I’ll never finish this, but the yarn is in good shape and could be used for something else. This is not worth saving. There are too many errors. Time to chuck it! —How long will it take me to finish this project? What is left to do on this pattern? Just weave in ends or a the entire back and sleeves on the sweater? Is it a complex stitch pattern or straight knitting? These things can make a big difference on the time it will take to complete the project. —Can I “downsize” this project? Is this supposed to be a giant shawl, but your momentum just ran out? Try taking whatever you have done and turning it into a smaller project which you can get done more quickly. —Is there something I can do to “love” this project again? Can I change out a yarn or change a stitch pattern? Maybe by changing things up a little, it will add a little spark to that stale project. —Can I consider completing this project an act of love? Can this project be donated to a charity? A lonely or sick neighbor? A local nursing home? Do you know someone who has been through some difficult times who could really use a thoughtful gift? If you can answer yes to any of these questions, then consider finishing the project to give away. While you are working on it, think of the recipient and how much it will brighten their day and warm their heart or say a few prayers for the recipient. —Can I make this into a fun event? That is exactly what we are doing each month. This is a great idea because your group is impartial to your projects and can offer advice on what needs to happen to get them done as well as holding you accountable to finishing. Keep in mind that we ALL have projects that we have fallen out of love with, for one reason or another. If you have a large pile of UFO’s, just realize that you will probably not get to all of them. If you need more time, put your projects in a basket with a deadline date on it. If you haven’t worked on it, then it is time to LET IT GO! You will be surprised at how much you won’t miss it. 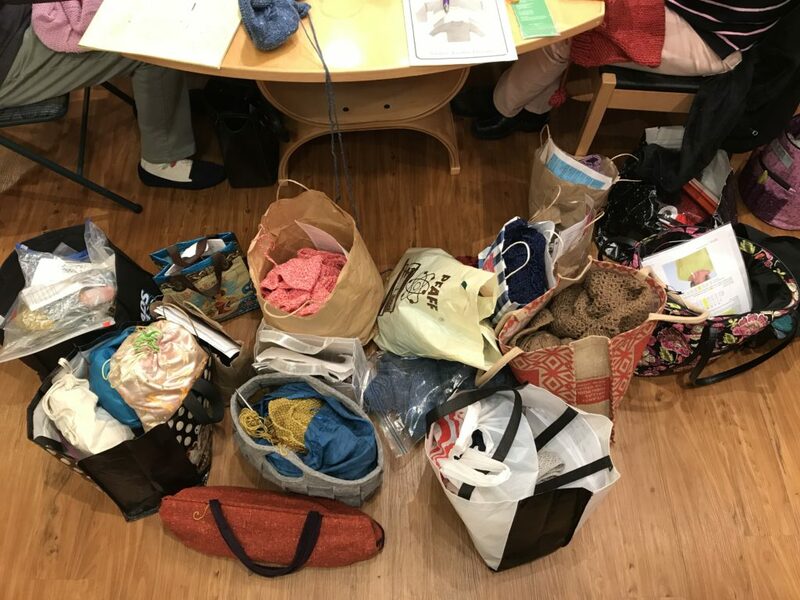 Next: Next post: Triangle Yarn Crawl Dates Announced!